Search.searchwamtv.com is a website promoted by a browser hijacker. If you find this page loading every time you open your browser, you must have recently installed freeware and did not notice a hijacker being attached. While browser hijackers are not serious computer threats, they need to be dealt with right away. Otherwise, you could be exposed to something malicious. These threats exist to redirect you to sponsored web pages but do not make sure that they are safe. So you could end up being led to a malicious site where malware could be lurking. And you get nothing from hijackers anyway. They are not useful and perform unwanted modifications to your browser without permission. If you want to avoid possibly getting infected with serious malware, you need to uninstall Search.searchwamtv.com. Once the hijacker enters your system, it will change your browser’s settings and set its promoted site as your homepage, new tabs and search engine. You might not recall the hijacker asking permission to do that and that’s because it does not need it. Those changes will also be irreversible unless you first delete Search.searchwamtv.com. They will affect all leading browsers, such as Internet Explorer, Google Chrome and Mozilla Firefox, so switching browsers will not help. The website supposedly allows you to watch TV shows more easier but all it does it provide links to Netflix, ESPN Go and Hulu. It also offers a search engine, which we do not recommend using. It will lead you to Saferbrowser Yahoo where you may encounter sponsored content among the legitimate results. Pressing on any weird links could lead you to a malicious infection so avoid doing that. And in general, the hijacker does not offer anything useful. Uninstall Search.searchwamtv.com. Browser hijackers are attached to freeware as extra offers and you need to manually deselect them to prevent their installation. To do this, access Advanced or Custom settings and you will see whether something has been added. If there is, you will be allowed to deselect it. Ensure that you deselect everything because otherwise, you will end up allowing all kinds of unwanted programs to install. 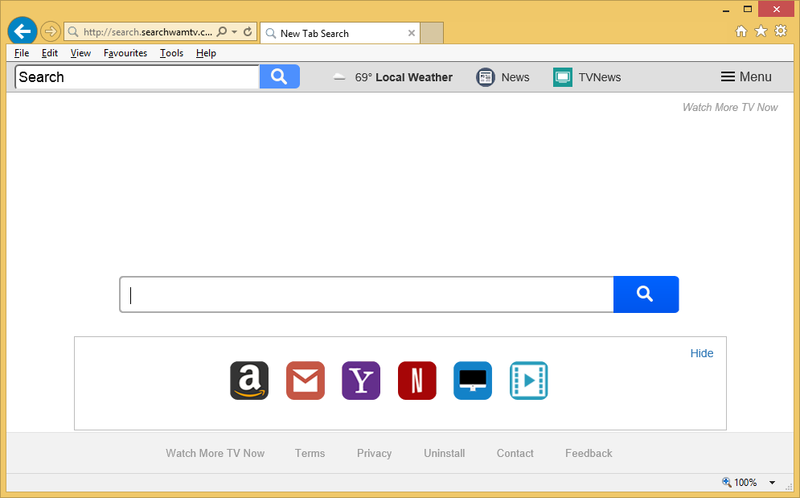 It’s much easier to uncheck a few boxes than it would be remove Search.searchwamtv.com or similar later on. You have two ways to delete Search.searchwamtv.com, manually and automatically. If you choose manual Search.searchwamtv.com removal, you will need to find the hijacker yourself, which might be an issue as it’s hiding. This would be why we recommend using anti-spyware and allowing it to get rid of the hijacker.